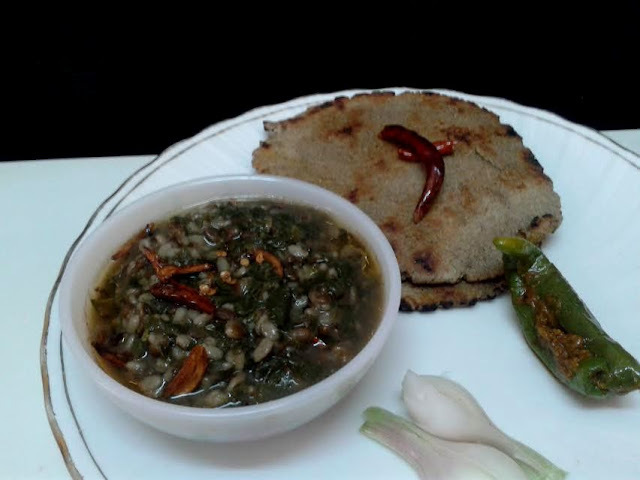 Sagpaita is a North Indian recipe which is made with pulses and bathua or spinach. People often make it with green moong dal or chana dal. But at our home it is made with bathua ka saag and black urad dal and is given tadka by garlic, heeng and dry whole red chili. It is best served with besan or bajara chapati and roasted tomato chutney. It is mostly made during winters as bathua is only available in this season. You can also make it by adding spinach or both saag. 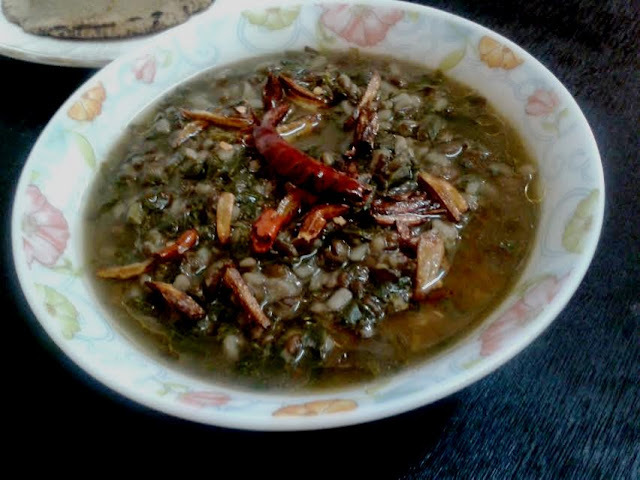 But with urad dal, bathua combination is mostly preferred. These days, desi tomatoes are available which can be roasted and can be made into salad by adding onions and green chillies or serve with simple onion and fresh green chili pickle. सग्पैता या साग वाली दाल उत्तर भारत की रेसिपी है जिसे दाल के साथ साग डालकर बनाया जाता है. कुछ लोग इसे हरी मूंग दाल, धुली उरद दाल या फिर चना दाल के साथ बनाते हैं लेकिन हम इसे काली छिलके वाली उरद की दाल के साथ बथुए का साग डालकर बनाते हैं और जिसे लहसुन, हींग और सूखी मिर्च के तड़के के साथ तैयार करते हैं. दाल को साफ़ कर लें और धोकर ५ मिनट के लिए भिगो दें, बथुए को साफ़ करके अच्छी तरह से धो लें. अब दाल को पानी डालकर एक उबाल आने दें फिर इसकी गन्दगी को ऊपर से निकाल दें, इसमें नमक, हरी मिर्च, लाल मिर्च पाउडर, बथुआ और अदरक डालकर कम से कम १५ मिनट या फिर दाल के गल जाने तक पका लें. wash and soak the dal for 5 minutes, Clean, wash and finely cut the bathua. Now add dal and water let it come to a boil then discard the dirt of dal, add chopped bathua, red chili,salt, chopped ginger and chopped green chili, cook the dal for 15 minutes or till tender. Heat the ghee in tadka pan add heeng, fry the garlic when the garlic become golden and crisp add broken whole red chili pour the tadka onto the dal. switch off the gas. 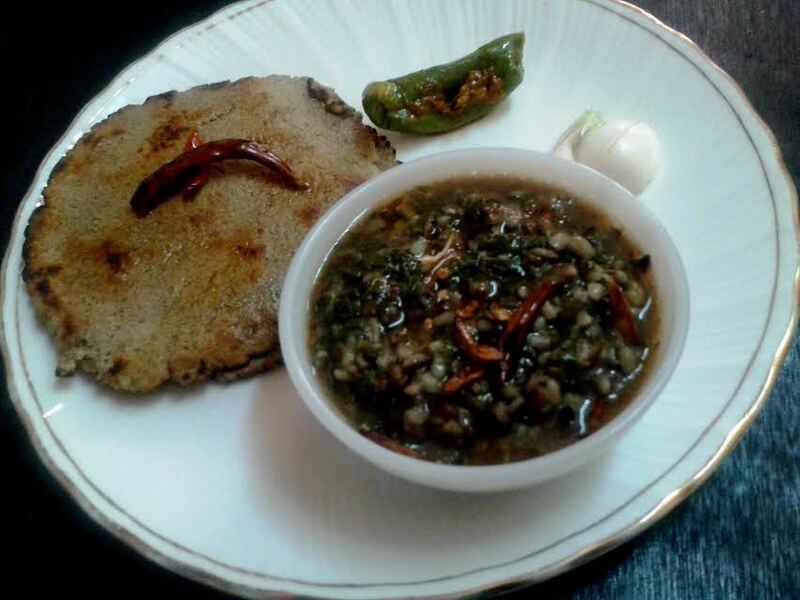 Serve with bajra or normal chapati with salad or pickle.